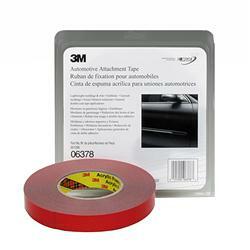 3M(TM) Automotive Acrylic Foam Attachment Tape 06378 is a .030-inch thick gray acrylic foam tape with proven performance acrylic adhesive and a red release liner. Jaco Aerospace and Industrial is your one stop resource for 3M(TM) Automotive Attachment Tape 06378, Gray, 7/8 in x 20 yd, 30 mil, 12 per case and all of your 3M Products, Tapes, aerospace and industrial needs. SKU Marketplace Product Description: 3M(TM) Automotive Acrylic Foam Attachment Tape 06378 is a .030-inch thick gray acrylic foam tape with proven performance acrylic adhesive and a red release liner.